Each Udo`s Choice Super 8 Hi-Count Microbiotics capsule guarantees 30 billion viable organisms of beneficial bacteria that are absolutely essential for maintaining proper digestion and helping to sustain health. These practitioner-strength microbiotics are some of the very best available on the market. Beneficial bacteria, pathogenic bacteria and yeast should balance each other out in the intestines. However, the balance can be disrupted by modern diet, chlorinated water, stress or medications. 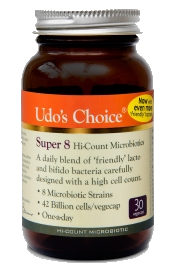 Udo`s Choice Super 8 has been specially formulated to be effective in helping to support the digestive system. The specific strains used in Super 8 have been specially chosen for their value to upper bowel health and have been formulated to the appropriate viable count. Micro-crystalline cellulose, magnesium stearate and ascorbic acid.